I didn't have a spare 21 minutes this morning to spend watching this profile of Richard Thompson, the creator of what I once called "The Best Comic Strip Being Drawn Today." But I did anyway. It's a terrific overview of his work and an honest, unsentimental glimpse of what Parkinson's Disease has robbed him (and us) of. The film calls him a "cartoonists' cartoonist," which I've always thought was a sort of slippery phrase in any context (Comedians' comedian? Writers' writer? Surgeons' surgeon?). What does that mean? In this case, it means to me that Richard does things I wish I could do, as well as things I don't understand how anyone could do. He's the very model of "working hard to make it look easy." The film touches on him doing 17 drafts of a cartoon that looks like it was scribbled out in two minutes. I am agape. Asking for 21 minutes of anybody's time is asking a lot, but this was worth mine. The Art of Richard Thompson from GVI on Vimeo. This is a post about a board. I've used the same art board for about 30 years. Instead of one of those nifty tilting drafting tables (which I'd love but have no room for), I rest the board on my lap to draw on. This page from Mom's Cancer shows me and my board in action. Art boards are made of light, soft wood so you can stick tacks into them. They're meant to take some abuse. Ink, paint, tape and glue are scars that an art board wears proudly. Early on, I smartly decided to use one side of the board for drawing and painting, and the other side for cutting paper with an X-Acto blade. The front stayed smooth while the back got scored and sliced. That worked fine for a long time, until the cutting side became so lumpy and choppy I couldn't even cut a straight line on it anymore. So yesterday I cemented a cutting mat to the back. I inherited the green plastic mat from my Mom, who used it for sewing, and I hadn't done much with it since. Time to put it to work. Since the cutting mat was larger than the board, I had to trim it to size. Turns out that's really tough to do! I mean, I realize the entire point of a cutting mat is that it's hard to cut, but I hacked at this thing with a utility knife for an hour and hardly dented it! If anybody ever pulls a gun on me I'm grabbing this mat, because I'm pretty sure it could stop a bullet. I ended up cutting it with a jigsaw. I expect this board upgrade to be good for another 30 years. Artists aren't supposed to fetishize their tools--imbue them with so much power that they're afraid to change them or even use them at all. I had an art teacher in college who took a pair of scissors to a new, expensive brush just to make the point that the tools exist to serve you, not vice versa. But man, this board and I have some history. Although it came from an art supply store rather than the Lady of the Lake, it nonetheless feels a bit like my Excalibur. An artist's board is personal. 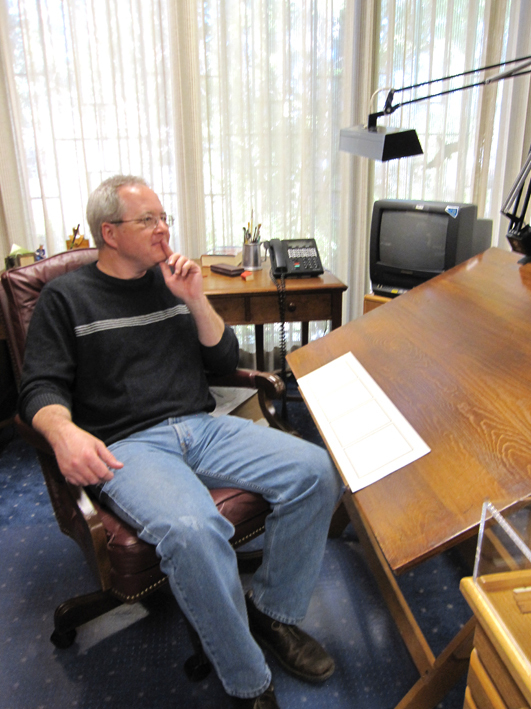 I've had the privilege of sitting at the drawing board of Charles Schulz--not the board that's exhibited at his museum, but a second board he used at home. I hardly have a mystical bone in my body, but it's impossible (impossible!) to sit at that board and not feel the creative mojo emanating from it. 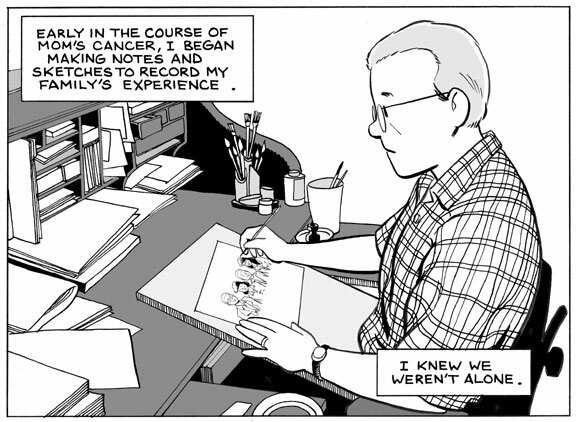 You can see the ghosts of art and letters carved into the soft wood as Schulz's nibs bore down through his paper. I mean that literally--you can read words Schulz wrote. Several years ago, Karen and I went to the estate sale of a watercolorist and printmaker who lived in our neighborhood. I never met her before she died, but when I saw her drawing boards tossed into the garage as "scrap lumber," I knew I owed it to her to save them. I paid a couple of bucks and took them home, and use them from time to time even though they're warped. My nod to her. Mike Lynch is a pal as well as a cartoonist whose career I admire and learn what I can from. He's one of a shrinking number of single-panel magazine cartoonists who actually make a living at it. Don't stare too hard at the mythical creature or you may frighten it away. 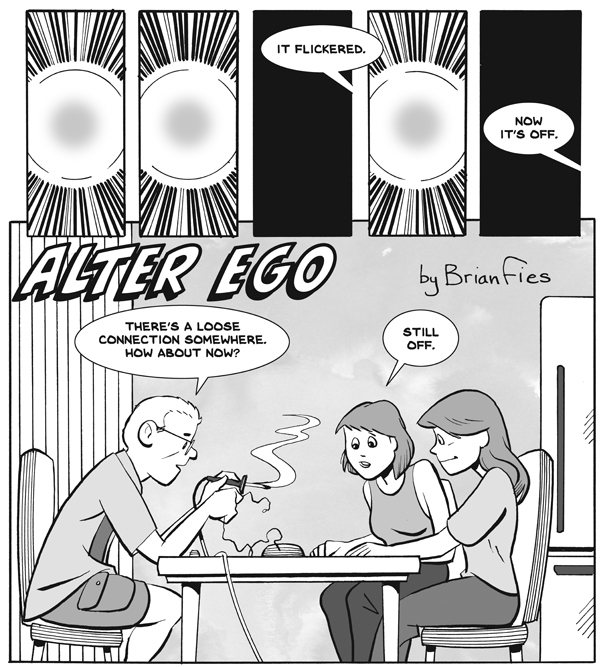 A couple of years ago, Mike and three cartoonist friends self-published a little zine called Raconteur as an outlet for longer four-page pieces. As the zine's mission statement reads, it's "a collection of true stories written and illustrated by cartoonists who usually specialize in other formats." Very sadly, one of the original Raconteurs, Jeff Pert, died suddenly (at age 55!) last year. A few months ago, Mike asked me if I wanted to be a Raconteur. When Dorothy Parker asks if you want to join her for lunch at the Algonquin, you don't think twice. So Raconteur #5 is out and I'm in it. Also in it are Mike, New Yorker-and-other-places cartoonist John Klossner, cartoonist/illustrator Brian Moore, and syndicated cartoonist ("Off the Mark") Mark Parisi. 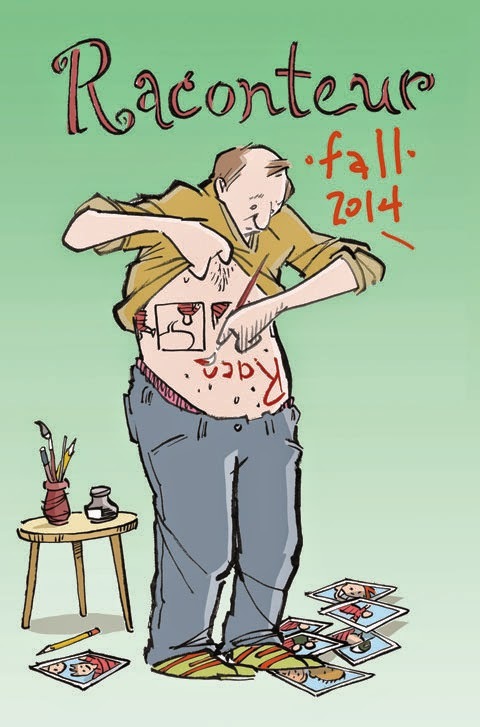 That five--not four but five!--cartoonists for the price of . . . well, I don't really know what the going price of cartoonists is these days, but we don't come cheap, even by the pound. If you're interested in five little slice-of-life stories, I'd be very happy to sign and send you a copy for $5. Honestly, that's probably asking a lot for a slim 20-page comic, but they're professionally printed (color cover, black-and-white guts), the stories are good, and I'm proud to be in it. Also, postage is included, so that knocks like a buck off the real price right there (I'm only mailing in the U.S. and Canada; sorry, but elsewhere's too much trouble). I'm not looking to get rich, just cover my share of the production costs. Here's a teaser of my four-page story about a little project my daughters and I did, with the Paypal ordering button right below. Hope you'll check it out! If not, we can still be friends. 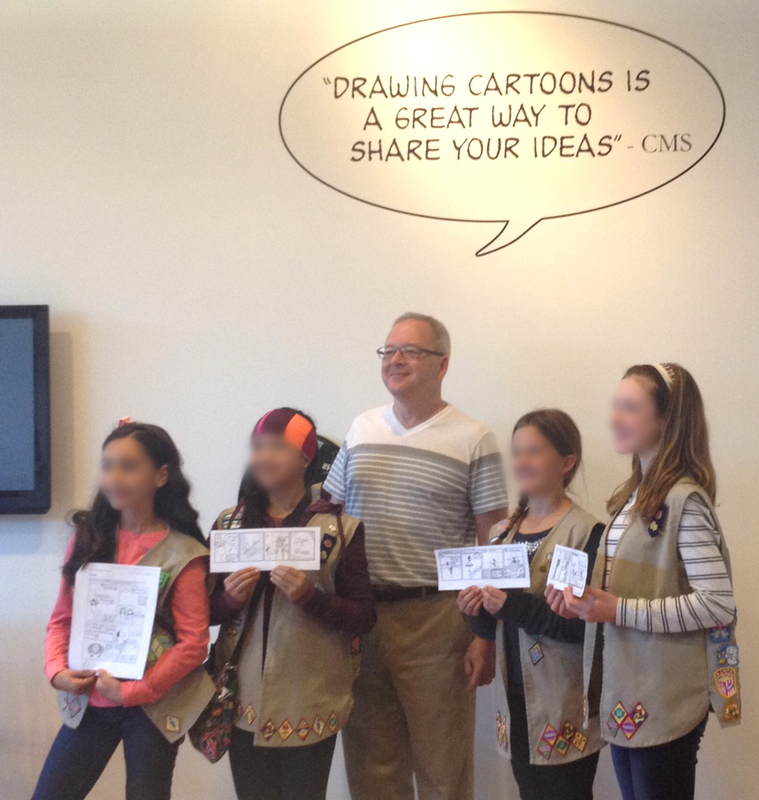 I had a good day teaching a three-hour workshop for Girl Scouts earning their Comic Artist badges at the Charles M. Schulz Museum & Research Center on Saturday. My wife Karen, who stayed involved in Girl Scouts after she led our daughters' troop for 12 years, came along as my invaluable girl wrangler. The 25 workshoppers were Cadettes in sixth through eighth grades, some of whom had traveled a couple of hours to be there. To that list I added a Number 6: Have a snack break. 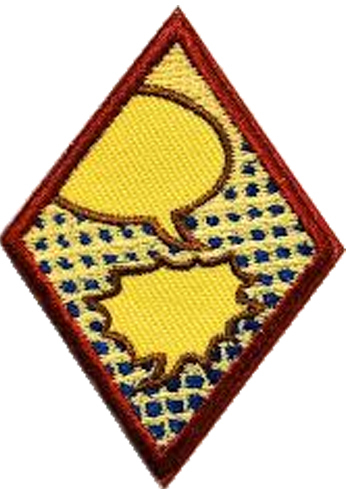 The first thing I told the Scouts is that the Badge Authorities had gotten it wrong and I was going to teach them the right way to make comics. You don't "add the words" after you "draw it out": the words go first. One way the Scouts could satisfy Task 1 was visiting with a comic artist. Since they were talking to me, that may have sufficed. However, I also gave them a quick survey of the history of comics, from Ben Franklin's "Join or Die" through 19th Century newspapers to 1938 Superman to 1960s Underground to graphic novels in the 2000s (with an obvious nod to a half century of Schulz). And tied it all together with a neat bow on top. I taught them the terminology for the parts of a comic: panel, balloon, border, gutter, etc. We talked about expressions, and how beginning with a basic face--two eyes and a nose--and just adding eyebrows and a mouth in different shapes and positions can communicate a wide variety of emotions. I had the Scouts do that themselves: I provided a blank face and they tried out different expressions. Throughout the day, I shared the results of willing Scouts with the rest of the group via the camera in my notebook computer. Trying out some expressions, communicating some emotions. my laptop's camera while she tells her story on the monitor. 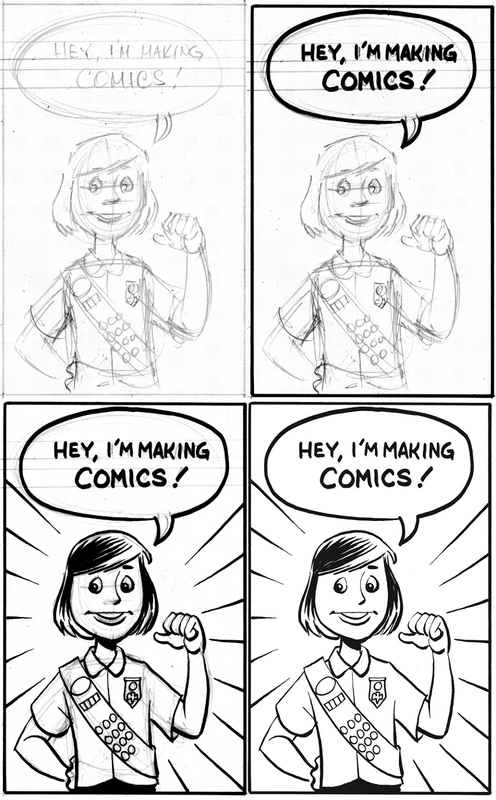 I taught them to make comics the traditional way, sketching in pencil first then going over it in ink, but I also explained that that method developed during the early days of newspaper print and wasn't really necessary for the Web or modern media. If they want to make comics with paint or collage, more power to them. However, I specifically stuck with black-and-white pencil-and-ink for two reasons: it's the simplest, and after the workshop they could tour the Schulz Museum and see that Mr. Schulz made his comics the exact same way they had. Pencil, then ink. The words go first. One exercise I call "And then what happened?" I draw a man walking along a street and ask the Scouts, "and then what happened?" This usually gets an enthusiastic response. I draw whatever they tell me. "A rock fell on his head!" "He looked up and saw a dump truck full of rocks above him!" "He woke up and it was all a dream but he still had a lump on his head!" Another exercise I stole from my friend Mita Mahato, who gave a workshop on zine-making at the latest Graphic Medicine conference I attended. First, we origamied a sheet of paper into an eight-page booklet. Then we did a jam comic, where one person starts a story based on my prompt, then passes it to her right for the next person to draw the next page, and so on until all the pages are full. It's an improvisational "And then what happened?" exercise meant to be quick and sloppy. It worked wonderfully. A couple of Scouts working on their jam comics. You can also see that I brought along some age-appropriate comics for them to read as examples of the form, including a new series called "Lumberjanes" and my friend Otis Frampton's "Oddly Normal." Finally, they had to apply everything we'd talked about by writing and drawing their own four-panel comics, which volunteers shared with the group (as they had their jam comics). I found features to point out and compliment in all of them. They made some good comics! Mission accomplished! That's also when I was sharply reminded of the difference between the sixth and eighth grades. In particular, there was a little group of older girls whose stories all involved characters flirting and making out, and one whose four-panel comic ended with a decapitation. As they shared their stories with the group, I expressed mild mock dismay--"Oh, I hope this story isn't going where I think it's going. OH NO!" --keeping in mind there were also 10-year-olds in the room and, by the way, I'm sort of representing the clean-cut Schulz Museum. I wasn't trying to smother anybody's creativity, but at the same time wanted to keep it G-rated. Well, those girls got their revenge. Reading through the workshop evaluations later, I received four in a row that rated their instructor as "poor" and said the museum needed to hire somebody less "sexist" who realized Girl Scouts could create stories about romance and death, too. I want to be liked as much as anybody, and that stung a little. I actually took a moment for self-reflection: was I sexist? My wife didn't think so. "That's just how they are at that age," said Karen. I think I'd've reacted the same if they'd all been boys. If any of them had said anything during the workshop, I'd have encouraged them to tell any type of story they wanted to later, and let their freak flags fly. That's what comics are about (a point I'd made when discussing Underground Comics)! Just not on my time. Many thanks to the Schulz Museum for asking me to do the workshop, especially Education Director Jessica Ruskin. Thanks to the two troop moms who stayed and were a big help, and especially thanks to all the Scouts, who were really terrific and fun to work with, even the mean girls in the corner. I'm supposed to teach another Cadette workshop in December, which I hope Jessica lets me do despite my bad reviews. Afterward, some of the troops asked to pose for photos with me and their completed comics (faces are blurred because I didn't get permission to show them). I love that Schulz quote on the wall of the museum's Education Room and will take any opportunity to pose under it.